Headed into last night, the Tigers were the favorites to win the World Series in large part because they had Justin Verlander, and people tend to favor teams who have ace starters in the playoffs. Last night, however, Justin Verlander did not pitch like an ace, and the Giants jumped on him for five runs in four innings of work – as many as he’d allowed in his previous seven starts combined. We’ll start with Pablo Sandoval, because he’s really the guy who did all the damage, and Verlander’s results were mostly fine if you exclude his match-ups against Kung Fu Panda. In the first inning, Verlander threw Sandoval a first pitch fastball on the outside corner in a perfect location for strike one, then got him to chase a change-up low that he fouled off for strike two. Having gone down and away twice with good results, Alex Avila calls for him to do it again, and sets up well off the plate and holds his glove low aiming for another down and away fastball. Verlander misses his spot entirely, and the pitch ends up here instead. You see Avila reaching back across to try and catch it — never a good sign — but the ball never gets to him because Sandoval deposited that high fastball into the seats in center field. This pitch basically sums up Verlander’s day – the ball didn’t go anywhere close to where he wanted to to, but he also didn’t get a typical result based on the pitch he actually threw. There’s no question Verlander missed his spot, but the result was an 0-2 fastball at 96 mph that is well out of the strike zone. The hard high fastball is one of Verlander’s main out pitches, and he regularly gets swinging strikes by going upstairs with two strikes. Had Avila set up in that exact location, no one would be calling this a bad pitch – it was simply an act of great hitting from Sandoval. Had Verlander not centered it so much — that pitch is basically right over the heart of the plate — Sandoval might not have been able to turn on it like he did, but a high fastball is thrown to generate a swing, so centering it in order to entice the batter to chase is pretty common. It’s a bad pitch in that it’s not what Verlander wanted to do, but 96 at the letters doesn’t get turned around for a home run too often, especially on an 0-2 count where the hitter has been setup to look low and away. That pitch was both bad location and good hitting. I won’t spend too much more time on Sandoval’s next home run because — spoiler alert — Jeff is working on a separate post about his performance, but suffice it to say that it followed a similar pattern. Sandoval didn’t hit meatballs – he hit good pitches that were out of the zone. But, I’m not here to let Verlander off the hook entirely. There was some good process in his bad results, but there were also some lousy pitches mixed in there, even if they didn’t go over the wall. Besides the home runs, Verlander gave up four other hits as well, though one of them was Angel Pagan’s cue shot that hit the third base bag and resulted in a double. We’re not going to hold that against Verlander, but he gave up hits to both Barry Zito and Marco Scutaro that were more bad pitching than good hitting. First, here’s Scutaro’s RBI single in the third inning that preceded Sandoval’s second home run. This is the eighth pitch of the at-bat, and Scutaro was doing his pesky foul-everything-off routine, so Verlander attempted to put him away with a slider down and out of the zone, only the pitch never gets there. 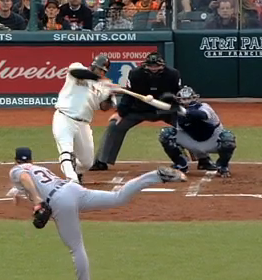 It ends up as a dead-center hanging off-speed pitch that Scutaro can easily smash right back through the box. Scutaro deserves credit for a good at-bat, hanging in there until he got something to hit, but this is also just a lousy pitch from Verlander. Then, the next inning, Zito came to the plate with two outs and a man on second. Barry Zito’s not much of a hitter, but there’s a man scoring position who can take off on contact, so a base hit here scores a run. This isn’t your typical groove-one-to-the-pitcher at-bat. Verlander has a chance to make sure he strands that runner by just blowing Zito away like he did the previous inning, but instead, he gets him to 2-2 and throws this. Okay, it’s a 97 mph fastball to a guy who has 30 base hits in 375 plate appearances, but the location is awful. That pitch is the definition of middle-middle. A little higher and Zito probably gets under it or swings through it; a little closer to the side of the plate and it’s probably a weak tapper towards an infielder. 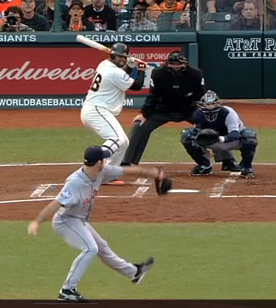 Instead, Zito lines it past Miguel Cabrera, and since Delmon Young can’t throw, Brandon Belt scores easily. It was the final nail in Verlander’s coffin, and ensured his day was done after just four innings of work. Any time a pitcher throws 98 pitches in four innings, you can bet that he didn’t have great command that day. While we usually talk about command problems in terms of missing the zone and falling behind hitters, Verlander’s command problems were more about leaving the ball over the heart of the plate, and the Giants made him pay when he did. However, we also have to note that Verlander actually didn’t pitch all that badly, especially on the two home runs. He threw some bad pitches, but he also threw some good pitches that got hit over the fence. This is part of why baseball is essentially impossible to predict in a single game. Some days, you can do everything right and still get beat. Verlander didn’t everything right last night, but he pitched better than his final line indicates. For one night, Pablo Sandoval was just better than he was, and he paid for throwing some bad pitches to low power singles hitters in critical situations. It shouldn’t cause the Tigers to worry about their ace, or think that he’s any less likely to pitch well in Game 5, but it does reinforce the point that on any given night, anything can happen. Including Barry Zito beating Justin Verlander in the World Series. We hoped you liked reading Justin Verlander’s Location Problem by Dave Cameron! Maybe he meant the Tigers’ bullpen, lol! Having another moment like in the chat! What was it? Mind faster than the fingers?